Introduction: With all the washing machines in the market and this and that type of washing machine claiming to be one of the best, anybody can get confused deciding which washing machine is actually one of the best ones. One of the proven, top brands is Bosch. From having the higher efficiency to having significantly faster washing times than other washing machines, Bosch is the one to turn to. As a matter of fact, Bosch has earned the Energy Star Excellence Award for 2011, 2012, and 2013, and this brand has received high ratings from leading consumer publications. Customers have praised the Bosch WTB86200UC 300 4.0 Cu. 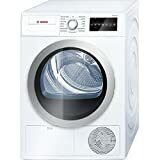 Ft. White Stackable Electric Dryer – Energy Star for various reasons. One reason is due to it having a compactable size that is perfect for freeing up extra space in the laundry room. 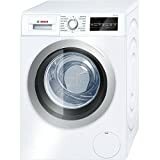 Others say it dries heavier material, such as heavy cotton, quickly, and many customers that they haven’t had any problems after using this washing machine for a long time. This Bosch product consists of a 24″ compact condensation dryer. Ducting is not required. It features a reversible door, and it can be stacked. It also has the most advanced technology available today. EcoSilence motor delivers long-lasting, efficient, and quiet performance. One load can be up to 18 towels. The creme of the crop is the Bosch WAT28401UC 500 2.2 Cu. Ft. White Stackable Front Load Washer – Energy Star. This product has many of the same wonderful features as the other top line Bosch washing machines. This product is the best of the best with performance, convenience, design, and efficiency. The design is European with a large door with a silver door ring, electronic control, space saving, a structured stainless steel drum that is snag free, and circular side walls that reduce vibration.